Sometimes a film comes along where the viewer can do nothing but sit back and let the whole, blissful business wash over them. Hobson’s Choice – director David Lean’s spirited screen adaptation of playwright Harold Brighouse’s humorous drama about Victorian social mores – is one such film. This witty delight starring Charles Laughton, Brenda de Banzie, John Mills and a young Prunella Scales – restored by STUDIOCANAL to mark its sixtieth anniversary – is still as sharp and relevant as when it was first released. 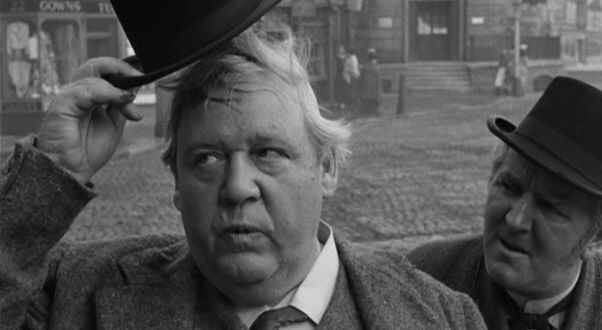 Following his wife’s death Henry Hobson (Laughton) runs both his house and his successful shoemakers business in a suburb of Victorian Manchester, with a rod of iron. Not until Maggie (de Banzie) – the eldest of his three daughters – marries his master cobbler Willie Mossop (Mills) and leaves to set up a rival business, does Henry realise just how destructive his domineering treatment of his family has been. There is a reason why David Lean’s films have been, and remain, so influential even today. Though only responsible for the direction of nineteen films – a relatively small amount when you consider current directors like the prolific Steven Spielberg and Tim Burton – each one, including Hobson’s Choice, were classics in their own right. His reputation as a perfectionist may not always have won him friends amongst the cast and crew on such legendary productions as Lawrence of Arabia (1962) and Dr Zhivago (1965), but his involvement in every aspect of the films from producing and scripting to editing the finished work shows when they are projected on the screen. His magic touch may have been due in part to his training. Unlike many of today’s wunderkinds who appear to expect – and often do – enter the industry at the top, Lean worked his way from the ground up, being everything from clapper boy and cutting room assistant at Gaumont British Studios to the chief editor for Gaumont British News. It was this training as an editor which showed later when he directed such films as Hobson’s Choice. Nothing on screen is superfluous. Shots – such as the panning in one scene, which leads the viewer’s eye along a street front to a basement window framing a shot of Willie and Maggie celebrating their wedding breakfast with Maggie’s sisters and their fiancés – are evocative, visual perfection. Scales (who plays Henry’s youngest daughter Vicky in the film) and producer Norman Spencer explain – in the interviews which make up the disc’s extras – how working with Lean was often a terrifying and intimidating experience. Experience which shaped and directed not only their careers, but also some of cinema’s most evocative and magical images.